July was a record month for earnings – the first time I had earned more than $2,000 in a month. This was in part due to the release of a popular new sewing pattern over at So Sew Easy that attracted a lot of traffic and for the Craftsy course giveaway as part of my review for the Sewing with Knits course (closes 14th Aug, still time to enter to win a free course). Expenses during the month were – Blogvault Back up – $19.00. 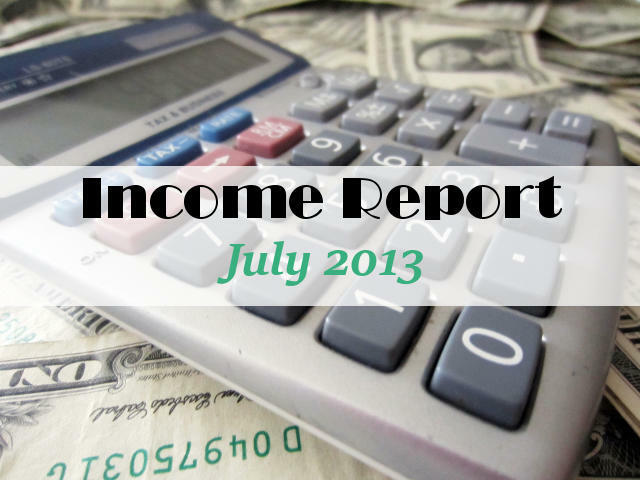 Blogher showed results for the first time in July. This is now the prime placement advert on the sewing blog and the single ad box brought in a really good rate. More than 6 Adsense boxes over 2 sites. I earned good money from the US views, but a much lower rate for international page views – of which I have a high percentage. As with most of the revenue earned, it is totally dependant on page views – the more visitors the more page views and the more earnings. Media.net was very variable during the month. I’m still not entirely convinced about this product, but the account manager asks me to give the system a while to optimise to make sure the best paying adverts are being displayed. Some days I earn nothing at all, other days, it’s OK. I wish all the days were OK and then it would be a winner. The double click method they employ before paying out really depends on them targeting the adverts correctly in order to get that second click and earn. Did you read the post last month about MMM being BLACKMAILED? I had to take certain security precautions during the month that did mean for some time my adverts were offline and only dummy adverts were displayed. Therefore I did lose out on some potential income during July. But the good news is that all of my security precautions paid off and there were no attacks or problems with the site. Thanks goodness. I also published my e-book to Amazon during July. The 20 Tips for Etsy Success book has been out for a while and was originally sold on this site. But there’s a lot of talk about making money from e-books on Amazon so I’m giving it a go. However selling prices there seem to be low and there is a lot of competition. I was satisfied with the sales in the first few weeks, and was delighted at the lovely feedback provided by the Moms Make Money readers – thank you to everyone who left a review. One that might be worth looking into if you have been denied from Adsense is Mad Ads. They usually won’t pay as much as Adsense but they can be a good alternative, or you can also run them alongside as a supplementary. They claim to pitch ad networks against each other so that every page view gets the best possible rate. I’ve just had one of their ad boxes on this site for a few days and will see how the rates look after a month. I’ll do a full review once I’ve had a chance to fully evaluate. wow deby! I’m always so impressed with your numbers! I know your pageviews are higher than mine, so that makes a difference, but you really do better with the share a sale then I seem to do :o) Working on it slowly…. Ha! Thanks for all your great info! That’s awesome! I’m still learning the different ways to make money, and I’ve heard people mention Sverve a few times, so I’m going to give it a try. Thanks for all your tips! You are welcome Tiffany. Remember to check into Sverve often because they don’t email you with new campaigns, you have to log in to see them. Thank you for sharing this information! It’s so nice to see how blogs can really come together. Thanks for sharing! It’s great to see the breakdown of numbers for some of the new bloggers. Awesome to see this and inspiring to boot. You have reset my expectations in a good way and really gotten me motivated. Thanks and keep up the good work as well as the updates. You may have spoke about this before, I’m interested in how to drive that initial bit of traffic. And then maintaining it. Would you recommend starting out buying ads, link parties, what else? I understand a lot of the other aspects of blogging, but I don’t know how to drive traffic to my blog in the first place. Hi Corinna, I’ve taken a look at your site and for the subjects you are writing about, you can draw traffic from linky parties. I’m not sure how effective an advert might be unless it was on a site with a lot of traffic but that would be expensive. But for me, search engine traffic is the most important and this takes time to establish, and requires several really good strong posts that people might be searching for in order to draw them in. I’ll send you an email with a few suggestions. Fantastic earnings, how many hours a day do you spend? I feel like I have insufficient time but I certainly would like to be contributing to our household income via my blog. My time spend varies a lot. I recently took off 9 days where I barely did anything and still everything kept running. And while I was working part-time, I didn’t have many hours for blogging etc and still things worked out OK, although I did earn a little less. I’ve never kept a record, but I would guess when I am full-time blogging its probably from 20-30hrs a week. Most of that time goes into developing my free sewing patterns. Inspiring.Thank you for your transparency! And thank you for sharing at All Things Pretty. Thanks for sharing your numbers! I find that a lot of bloggers don’t feel comfortable sharing this information, and am so glad to know of other ways to earn income. Well I wouldn’t be able to really stand here and try to give out blogging and earning advice on my site if I wasn’t at least prepared to back it up by showing that I was able to make money myself. There are far too many sites out there telling you do this, do that, sign up here but without backing up what they say with real numbers – I always like to know I am taking advice from someone who is following the method and being successful themselves. I love that you share this information with us every month. I’m going to have to check out ShareASale. Thanks for the informative post. I’m just starting to monetize and it feels like a foreign field to me right now. Visiting from Adorned From Above blog hop. Wow- I am heartily impressed with what you have done! I am also glad you shared. It is so hard to know where to spend time when promoting a blog, and trying to get sales on etsy and ebay… I am going to be ramping up my efforts and signing up for some of the services above. I am on Swerve too- I made $5 last month.. not much, but it’s a start! Yes, every little bit is a start. And you can always use several or even lots of ways to earn money, in which case lots of little bits may even add up to quite a bit. Keep it up! The easiest answer to this is to say that the best way to get more followers is two fold. Get more traffic to your site any which way you can by promoting anywhere and everywhere, and then have great content so when people arrive, they become engaged and interested in what you have to say and they want to follow you. Take a look at the recent post about 2- Tips for Pinterest and see if anything there can give you some ideas. Thanks for all the details you share. They are what will help me as I develop my blog over the next two months. This week I’m gonna dig deep into your articles then get started. I’m stoked!